The Islamic Development Department (Jakim) will expand the Halal Fast Force programme in all states to expedite and standardise the halal certification process. Deputy Prime Minister Datuk Seri Dr Ahmad Zahid Hamidi said the programme, which started in August last year, is being expanded in stages. “Since the Malaysia Halal Council’s establishment on June 8 last year, various short and long term initiatives have been implemented to support the country’s halal industry development. “This includes improving the issuance of the halal certification process through Halal Fast Force. “In the first five months of this year, we have received 977 applications for halal certification, 966 of which have been approved by Jakim,” he said in a statement after chairing the Malaysia Halal Council Meeting, today. Among those present included Ministers in the Prime Minister’s Department Datuk Seri Abdul Rahman Dahlan and Datuk Seri Jamil Khir Baharom; International Trade and Industry Minister Datuk Seri Mustapa Mohamed; Higher Education Minister Datuk Seri Idris Jusoh; and Urban Wellbeing, Housing and Local Government Minister Tan Sri Noh Omar. Zahid said the government is mobilising five important agendas for 2018-2020 to boost the halal ecosystem. “The agendas include empowering the Halal Professional Board at international level to produce more professionals in the halal field; setting up an International Halal Authority Board; and forming a Halal International Research Academy. “Others include creating a Malaysia Halal Academy to produce a technocrat generation in the halal industry and forming a Halal Innovation and Technology Centre to boost creativity and innovation in the halal industry,” he said. 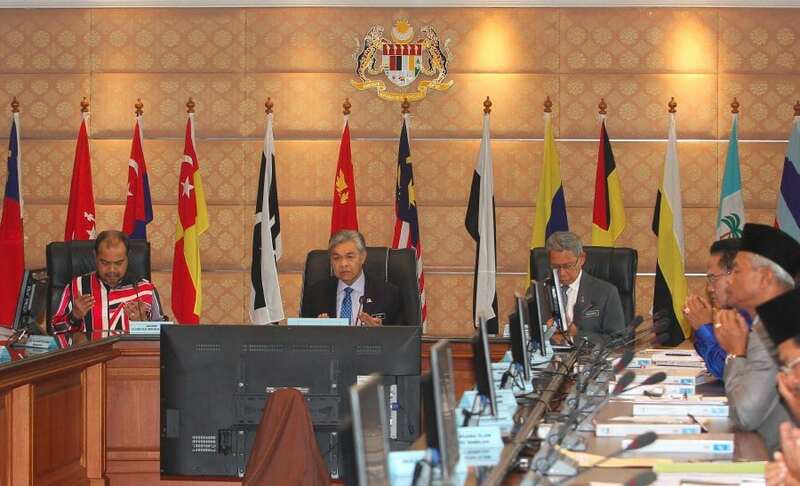 The council also decided that Malaysia will join the Board of Directors of the Standard and Metrology Institute for Islamic Countries (SMIIC) starting this year. The decision was in line with the government’s active role in the development of global halal standards and accreditation. “The SMIIC national committee, led by the Standards Department, will be the coordinating agency for all programmes under SMIIC for Malaysia,” said Zahid. He said the council also recognises the proposal for a blueprint to empower Bumiputeras in the halal industry, in which the blueprint will be coordinated with the Bumiputera Wellbeing Transformation and Bumiputera Economic Transformation Roadmap agenda.